With slightly under 129,000 registrations the Spanish passenger car market scored a loss of 3.6% over March 2018. Self-registrations on car manufacturers and dealerships were the only channel with growth over March last year (+ 14.7%). With – 4.4% the result for the Private Market was a bit better than for Short-Term Rentals (- 8.5%). 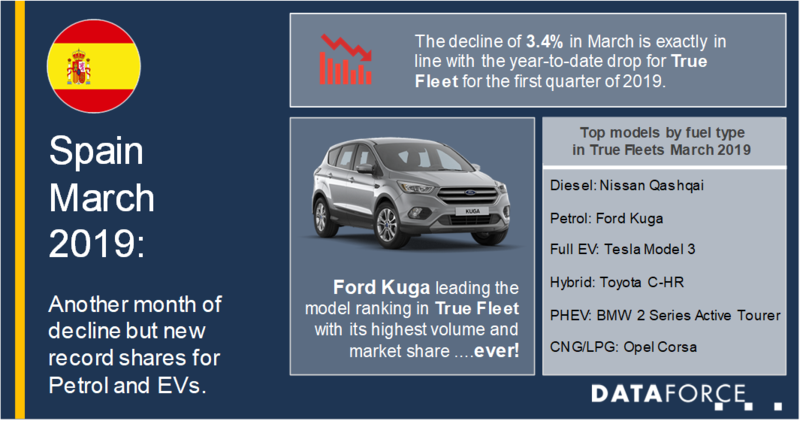 True Fleets missed its volume from last year’s March by around nine hundred registrations and the decline of 3.4% in March is exactly in line with the year-to-date drop for the first quarter of 2019. The first five manufacturers in the brand ranking were all able to increase their fleet registrations with a double-digit growth rate but behind the market leader Volkswagen the positions changed quite a lot. Ford took 2nd spot gaining seven positions which is also true for Toyota ranking 5th (+ 44.4%) behind Peugeot and BMW in 3rd and 4th respectively. Renault dropped back to 6th place followed by SEAT, Audi, Nissan and Citroën. Ford not only achieved a remarkable + 52.4% but scored its highest monthly volume since January 2008! What were the main drivers for this amazing result? Well, the Ecosport almost tripled its volume but models like the Ford Focus, Ford Edge and Ford Transit Custom were also in good shape. However, the biggest push came from the Kuga. Ford’s Compact SUV showed an extraordinary performance in March and was not only leading its vehicle class but became the number one model overall, leaving the Nissan Qashqai and the SEAT Leon trailing behind! With a market share of 4.6% the Kuga achieved a new record in Spain and the fact that more than 90% of its registrations were equipped with a Petrol engine had an impact on the overall fuel type picture. March saw several new records regarding the shares of the different fuel types. 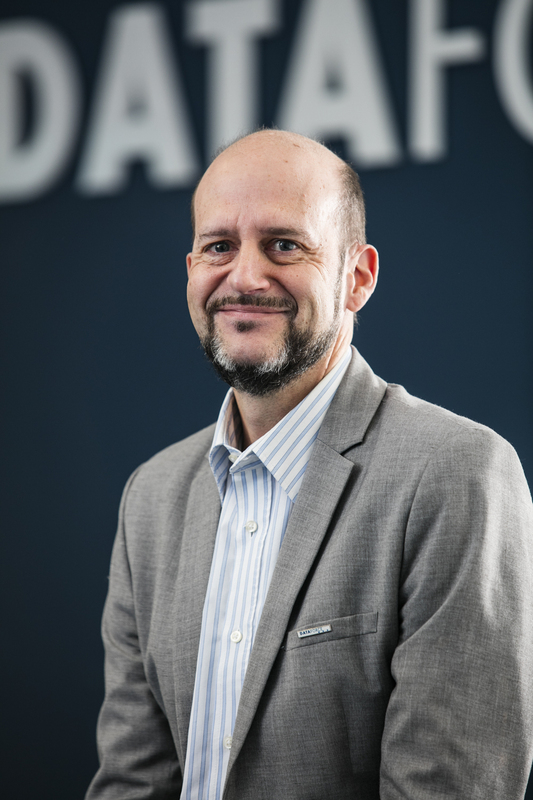 The one for Diesel powertrains (46.2%) was the lowest percentage on Dataforce records while the percentages of both Petrol and Full Electric reached new all-time highs with 39.0% and 1.9% respectively. Beside the Kuga mentioned above, it was more a general trend towards Petrol and Alternative fuel types. For only three out of the top-20 models were the Petrol shares lower than seen back in March 2017. This quick analysis also underlines the drawbacks when resorting to “average”. Yes, it is 46% for Diesel but there are huge differences across OEMs. If you look on the top-30 brands for this month – leaving Lexus and Tesla aside for obvious reasons – this month’s Diesel shares ranged from below 1% to more than 90%. The ranking of full EVs was led by Tesla’s Model 3 (again) but almost all main competitors showed a surplus in March. The same holds true for both Hybrids and Plug-In Hybrids where the BMW 2 Series Active Tourer and Toyota C-HR were the top sellers.